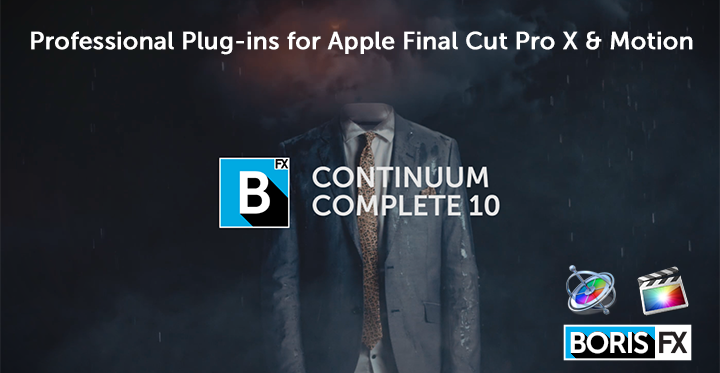 Boston, Massachusetts, USA – June 23, 2016 – Boris FX™, the leading plug-in developer of professional post-production tools, announces Boris Continuum Complete (BCC) 10 for Apple. Following recent releases for Avid, Adobe and Blackmagic DaVinci Resolve, BCC 10 now delivers major new tools for visual effects, title design, digital beauty work, and image restoration to the Final Cut Pro timeline. Remover fills in missing pixels & removes objects with clone and auto-fill options. Dropout Fixer restores tape based damaged footage with field dropouts. Reframer reformats and stylizes “vertical cell phone footage” into 16 x 9 for broadcast. GPU Acceleration: Filters include Beauty Studio, Fast Film Glow, Fast Film Process, Fast Lens Blur, Fast Film Glow Dissolve, Lens Blur Dissolve, and many more. Watch BCC 10 for Apple new features video. BCC 10 for Apple is now available and compatible with Final Cut Pro X and Motion 5.